Springfield, TN – I remember sitting in a chair in the corner of my bedroom. I can remember the way the light fell on the top of my head and over my shoulder. In my lap was a slim, cheap book on impressionism from the library. The book was opened to a beautiful young girl. I have no clue who the artist was. I was 30 years old, with 2 little boys and had never seen a museum, a set of oil paints, or a real painting. Oh, I’ve got to draw and paint and take 1,000’s of pictures, and own wonderful books who are may teachers. To paint my Heart, my Life. To walk through this life every day, looking, expecting magic, Oh! the places I’ve been, the people I’ve met, the galleries and show and museums and costumes and props and the tears and rejection, the awards and rewards. Wanda Choate has exhibited in many shows and received top honors, including OPA Awards of Excellence in 06, 07, 08, Honorable Mention in 2011 and Best of Show in the Central South. She is a Signature Member of the Oil Painters of America, and American Woman Artists. Most recently she was named Best In Show with her painting “Magdelen” in the American Women Artist Show in Easton, Maryland. 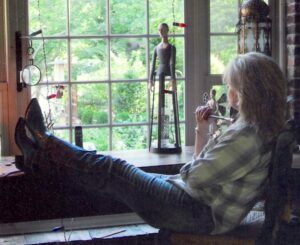 She continues to create still-life, figurative and landscape works from her studio, in Springfield Tennessee.